Proteins, such as those in animal tissue and plants, strongly absorb ultraviolet (UV) light at approximately 280 nm. Rather, it is the amino acids which make up the proteins that absorb the UV light. The strong absorption of UV light by proteins allows for rapid location and identification of protein samples, both liquid and solid, by microscopy and microspectroscopy. Commonly, the optical absorption of proteins is measured at 280 nm. At this wavelength, the absorption of proteins is mainly due to the amino acids tryptophan, tyrosine and cysteine with their molar absorption coefficients decreasing in that order. Of course, the molar absorption coefficient of the protein itself at 280 nm will depend upon the relative concentrations of each of these three amino acids. Therefore, different proteins can have different absorption coefficients and even the wavelength of the maximum absorption may differ. This fact can be used to help identify different types of proteins by relatively fast and simple optical tests. Most commonly, protein crystals are imaged by their intrinsic protein fluorescence. This is mostly the fluorescence of tryptophan. As such, protein fluorescence requires very powerful UV light sources and very sensitive cameras because the fluorescent emission from proteins is so weak. However, powerful UV light sources can destroy the protein due to long exposure times required to obtain significant data. A much faster way to image proteins, either in cells, tissues or as crystals, is to utilize their strong absorption of UV light as a contrasting mechanism. By using a ultraviolet microscope or microspectrophotometer equipped for UV imaging, the sample containing the protein is imaged with 280 nm light. The protein will absorb this light more strongly than the surrounding sample and will appear darker. 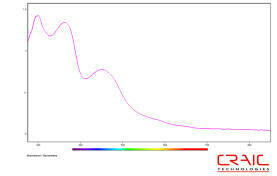 See the picture above for an example of UV absorption of a protein crystal in salt solution. This technique is very fast, exposing the protein to UV light for far less time. 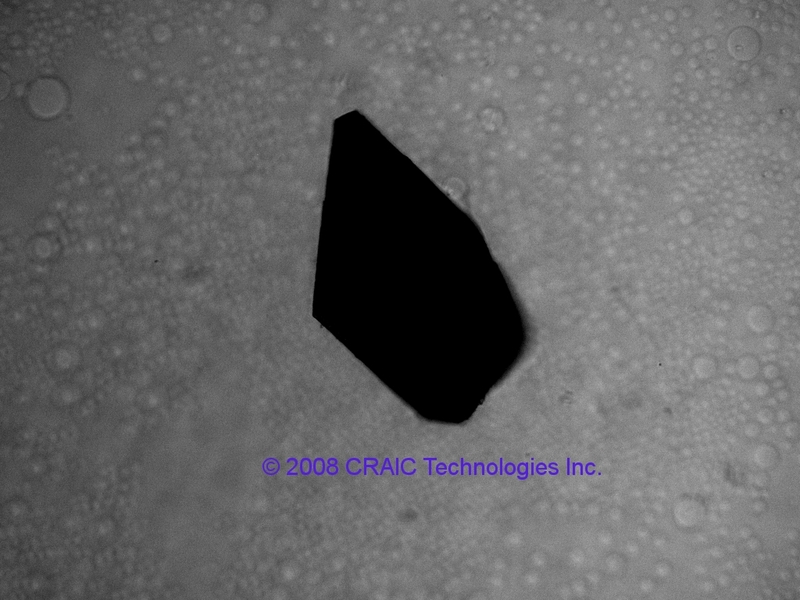 CRAIC Technologies microspectrophotometers are used to acquire spectra of microscopic samples containing proteins, such as individual protein crystals, by their UV absorption. The microspectrophotometer consists of a UV-visible-NIR range microscope integrated with a spectrophotometer. As such, it is able to measure the UV-visible-NIR spectra of microscopic samples of tissue, protein crystals and other protein containing structures. By using absorption, it is able to measure these samples quickly and non-destructively. Microspectroscopy allows the user to learn more about the optical features and the chemical structure of the protein. Additionally, microspectroscopy also allows for the determination of the concentration of protein in a sample as the absorption at 280 nm is proportional to the protein concentration. If the protein sample does not have tryptophan or tyrosine, both of which absorb at 280 nm, the concentration can still be easily measured by the Scopes Method. In this particular method, the protein concentration is determined by the absorption at 205 nm in which the peptide bonds are analyzed directly. DNA or RNA purity can also be determined by measuring the absorption ratios of 260 to 280 nm. This is because the nucleic acids that make up DNA and RNA absorb strongly at 260 nm. A ratio of about 2.0 is considered "pure" for RNA while a ratio of about 1.8 is considered "pure" for DNA. Lower ratios indicate the presence of protein. Proteins absorb strongly at 280 nm due to three types of its constituent amino acids. The peptide bonds found in the amino acids also absorb at 205 nm. The UV absorption of protein can be used both to quickly image and acquire spectra of microscopic samples non-destructively. The spectra can also be used to determine protein concentrations and the relative amounts of protein to DNA or RNA.